The Île-de-France  is the compact region immediately surrounding the capital of France, Paris. 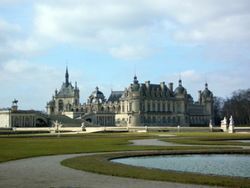 As such, the region includes the now far-flung suburbs of the Paris metropolis, together with several large surrounding towns that form part of the larger conurbanation. All is not urban sprawl, however: the region is also known for its natural beauties, in the form of parks, forests and river lands. Marne-la-Vallée - Home of Disneyland Paris. There are many cycle lanes on routes into Paris, but be careful as you also share the road with motorbikes and cars which can be inconsiderate. There are several free Autoroutes and 4 lane roads for getting round Île-de-France, however on weekdays there is a lot of congestion between the hours 8 - 9:30 AM and 17:30 - 19:30 PM, and it is really not advisable to travel then. This congestion becomes a lot less worse the further away from Paris you are. Le boulevard périphérique: a road ring which marks the limit of "Paris will intra muros". This is essentially a motorway as there are no roundabouts or intersections, however it is famous for its obstructions. Be careful though, as the cars entering onto the road from the right have priority. A86: Very useful road that nearly completely circles Paris. The recently opened tunnel between Rueil-Malmaison and Versailles is tolled (fairly expensive) and is open to cars only (HGVs and motorcycles prohibited). A14: A13 bypass. Toll road, fairly expensive. N104: La Francilienne. A half circular road around the North and Eastern sides of Paris. As it is further out than the A86, there is considerably less congestion. N118: Connects western Paris to A10 and N104. N184: Connects Western Paris to A13, A15 and A16. Useful link if you are driving from Calais or to Normandy via the N14. A network of regional trains takes you in and out of Paris: Transilien and RER. 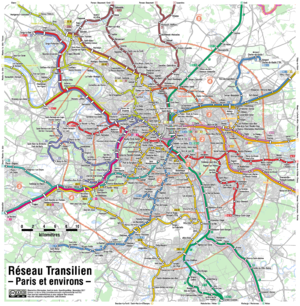 RER is a regional network or rail lines going through Paris. RER lines are numbered A to E. RER is a network of 256 stations in and around Paris and runs on over 587km (365mi) of track. There are 5 lines, (A, B, C, D and E) that cross Paris, connecting suburbs on opposite sides. Stations with REr connections bare the blue signs with a white RER. Transilien is the brand name for traditional rail lines radiating from the Paris termini. Transilien lines are numbered J to U. Trains depart from the main train stations (Lyon, Est, Nord, Saint-Lazare and Montparnasse) and La Défense. Transilien uses brand new trains that offer a good ride. It is usually cheaper to purchase a daily ticket than a return ticket for most journeys, but check when purchasing. Trains run from 4.45 a.m. to 1.30 a.m. Smoking is not allowed in the stations or on the trains. Paris is one of the world’s most attractive cities. Often described as the city of lights. It is the capital of Île de France and in fact France as a whole. The list of places to go and things to do is endless. Landmarks such as Arc de Triomphe, Champs Elysees, Eglise Madeleine, Eglise du Dome, Notre Dame, Grand Palais, Ile de la Cite, National Assembly, Opera Garnier, Palais de Justice, Palais des Congres, Palais Luxembourg, Place de la Bastille, Place Concorde, Palais Royal and the Eiffel Tower are a must when visiting Paris. Other attractions to visit include: Disneyland Paris, Fontaine Medicis, Institut de France, Montmartre, Obelisque, Opera Bastille, Paris Fountains, Place Vendome, Saint-Sulpice, St-Etienne-du-Mont, St. Augustin, St Germain, Sorbonne, Unknown Soldier and the Seine River. Some museums to visit include Galeries Nationales, Musee des Beaux-Arts, Musee de Cinema, Musee de l'Armee, Musee de l'Homme, Palais – Decouverte, Pantheon, Pantheon Crypt and Musee du Louvre. There are many ways to tour Paris, here are some of them: Bus Service, Coach Service, Paris Metro, RER Rail Service, Eurostar to London, Car Rentals, Paris Airports and Paris Train Stations. When visiting Paris or anywhere indeed, Accommodation is always the first checkpoint. Some of the most popular hotels are listed here: Arc de Triomphe, Bois de Boulogne, Buttes Chaumont, Champs Elysees, Eiffel Tower, Gare du Nord, La Defense, Latin Quarter, Louvre District, Montparnasse, Opera Bastille, Opera Garnier, Père-Lachaise, Place d'Italie, Pompidou Centre and Sacré Coeur. If you decide to travel by motor home or caravan, or you wish to camp while discovering Île-de-France, then see this list which features the camp sites which are open all year round. This page was last edited on 15 March 2018, at 14:25.